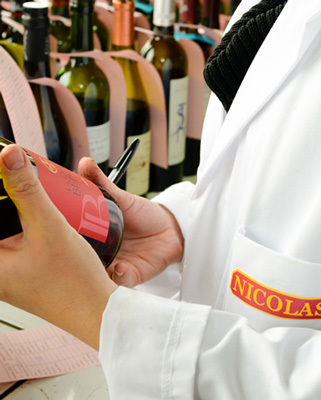 At Nicolas, QUALITY is the consequence of a thorough selection process. To ensure your pleasure when tasting our wines, our quality control methods have proven effective for over 70 years. Our team of talented oenologists guarantees you high quality, traceable, selection for all our products. In particular we taste all the wines before we purchase them. Each year, nearly 18,000 samples are tasted by our oenologists. If the wine offered by a winegrower is approved, our buyers can purchase it to be sold in Nicolas shops. On the other hand, if the wine is not approved after tasting, it will never be brought into our shops regardless of the financial profit that we could make. To reinforce the tasting phase, we also do an oenological analysis in our laboratory of all approved wines. This then becomes the reference standard for this wine and a guarantee of our traceability. This selection process is systematic for all wines that we offer, regardless of their sale price. Quality control for wines is carried out early in the product selection process, but also with each delivery. As each wine is received it is compared to its selection sample. In the event of default, the product is blocked in the warehouse and returned to the supplier who will have to explain the discrepancy and provide a new delivery which will be controlled in turn.